G Dragon (권지용) of Big Bang attended the press conference of his '2013 World Tour: One Of A Kind' held in Beijing, China on May 13, 2013. 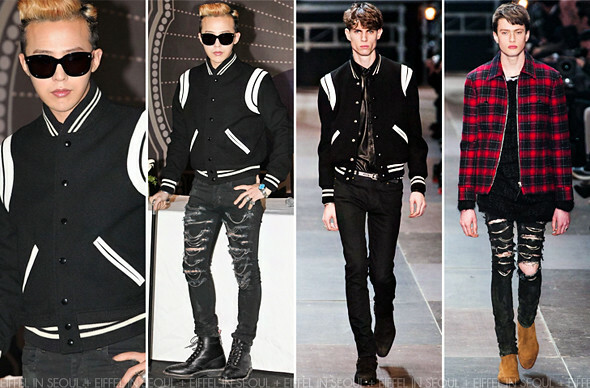 The star was dressed in a monochrome outfit from Saint Laurent Paris Fall/Winter 2013 menswear collection. He accessorized his look with Chrome Hearts rings, a pair of leather boots and tinted sunglasses. I absolutely adore varsity jackets and I love it on him. While I'm on the fence about those chained denim, I thought this was a pretty bangin' look.